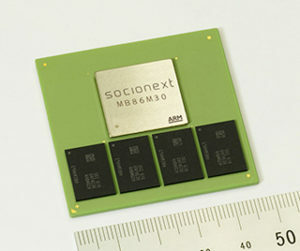 The Socionext “MB86M30” provides video and audio encoding, decoding, and transcoding of HEVC/H.265, AVC/H.264 and MPEG2 standards suitable for applications range from broadcasting, IP video distribution, medical and signage. The M30 offers real-time encoding/decoding with optional 10ms ultra low latency. The encoding algorithm supports HDR (High Dynamic Range) video . It features low power consumption at 6.3W at 4K/60p HEVC encoding with four DRAMs embedded in a single package to allow for increase in system density. The device is controlled by a host CPU via a PCIe interface. Contact Socionext to learn more about how our codec can serve your needs. Transcoding *3 HEVC to HEVC, H.264 to HEVC, MPEG2 to HEVC, etc. *1: Ultra Low Latency Encoding is optional. *2: Decode function is verified with the stream generated by MB86M30. Regarding support status of other streams, please contact us. *3: Transcoding function is optional. Click to download the MB86M30 fact sheet. For more information, please complete the form below or call us at toll free +1-844-680-3453. Please enter a number greater than or equal to 500.